Welcome to the LIFX 1000 Lumens LED Light Bulbs Giveaway! Do you want Android/iOS app controlled LED light bulbs? 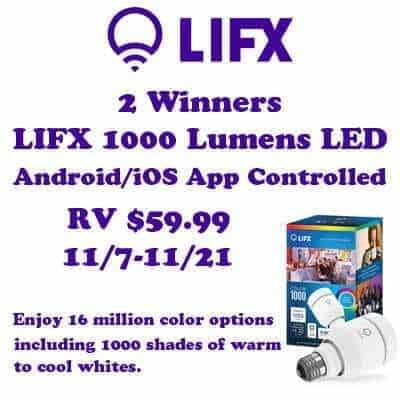 Enter giveaway to win LIFX 1000 Lumens LED bulbs! Disclosure: Work Money Fun did not receive compensation for LED Light Giveaway and is not responsible for prize fulfillment. I’m interested in seeing all the color options they have. I like that there is 1000 shades of warm to cool whites to choose from. I like how there are so many color options. I like that it is long lasting.